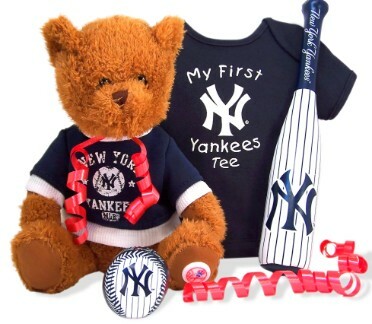 Celebrate the arrival of a new baby boy Yankees Fan with this adorable Navy T-Shirt, Teddy Bear and Softee Bat and Ball Gift Set. This adorable gift set is sure to make the new baby boy giggle as he learns how to swing a bat and join in on Yankee fun. Each item in this gift set is officially licensed Yankee merchandise. Now even your little ones can cheer on their favorite MLB team. This gift set is beautifully packaged in a clear cellophane bag and topped with a huge red bow. Go Yankees! Go!!! 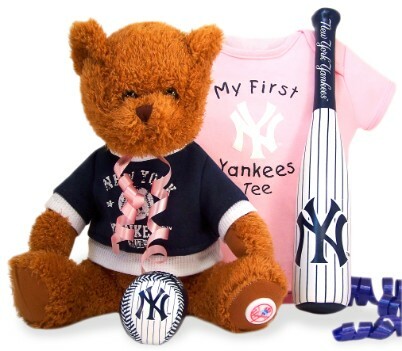 Celebrate the arrival of a new baby girl Yankees Fan with this adorable Pink T-Shirt, Teddy Bear and Softee Bat and Ball Gift Set. This adorably girly gift is sure to make the new baby girl giggle as she learns how to swing a bat and join in on Yankee fun. Each item in this gift set is officially licensed Yankee merchandise. This gift set is beautifully packaged in a clear cellophane bag and topped with a huge pink bow.